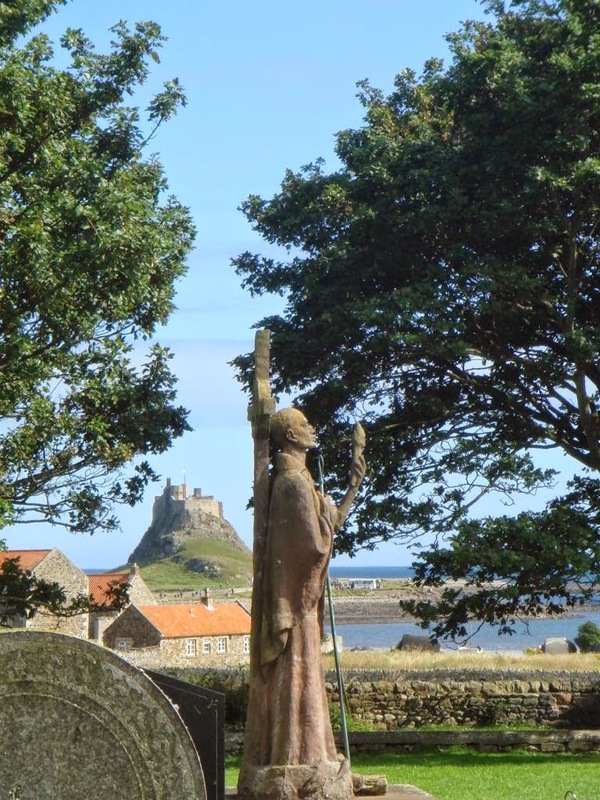 To appreciate the story of St Aidan of Lindisfarne, who died on 31 August 651, there's really no substitute for reading the detailed account of his life provided to us by Bede. So here are some extracts from Book 3 of Bede's Ecclesiastical History, telling how Aidan came from Iona at the request of King Oswald of Northumbria to convert his kingdom to Christianity. The translation is from A History of the English Church and People, trans. Leo Sherley-Price (Penguin, 1974), pp.144-5, 148-50, 168-70. 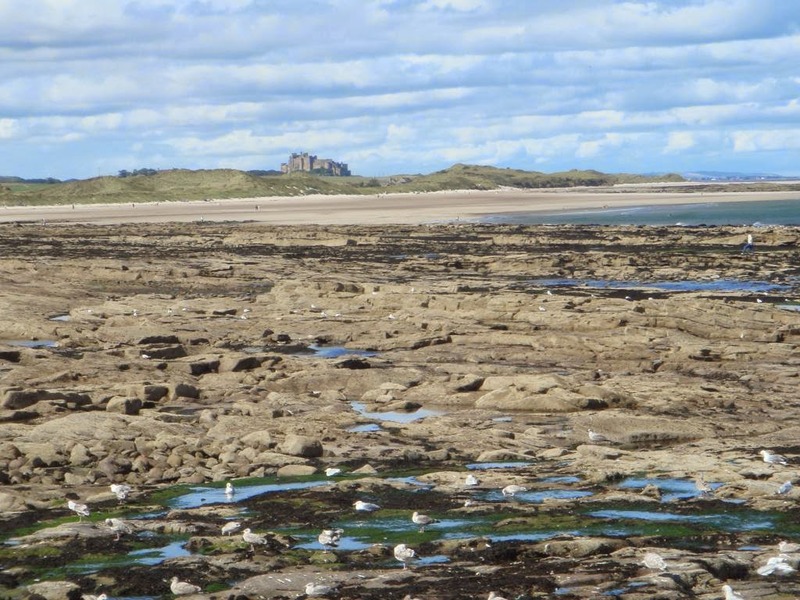 On Aidan's arrival, the king appointed the island of Lindisfarne to be his see at his own request. As the tide ebbs and flows, this place is surrounded by sea twice a day like an island, and twice a day the sand dries and joins it to the mainland. The king always listened humbly and readily to Aidan's advice and diligently set himself to establish and extend the church of Christ throughout his kingdom. And while the bishop, who was not fluent in the English language, preached the Gospel, it was most delightful to see the king himself interpreting the word of God to his ealdorman and thanes; for he himself had obtained perfect command of the Scottish tongue during his long exile. 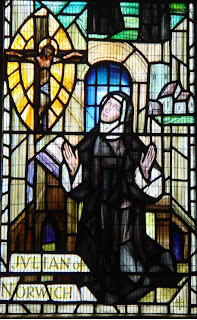 Henceforward many Scots arrived day by day in Britain and proclaimed the word of God with great devotion in all the provinces under Oswald's rule, while those of them who were in priest's orders ministered the grace of Baptism to those who believed. 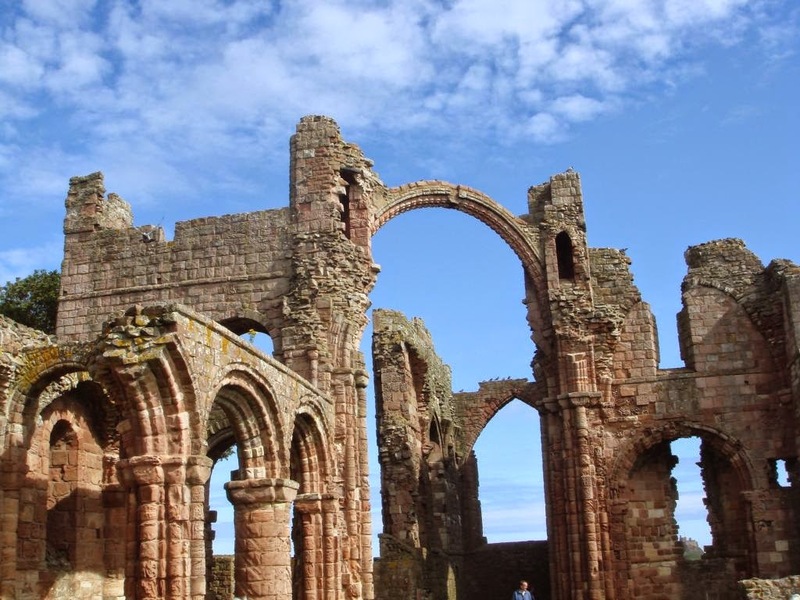 Churches were built in several places, and the people flocked gladly to hear the word of God, while the king of his bounty gave lands and endowments to establish monasteries, and the English, both noble and simple, were instructed by their Scots teachers to observe a monastic life. It was from this island and from this community of monks... that Aidan was sent, when he had been made bishop, to preach the faith of Christ to a province of the English. Among other evidences of holy life, he gave his clergy an inspiring example of self-discipline and continence, and the highest recommendation of his teaching to all was that he and his followers lived as they taught. He never sought or cared for any worldly possessions, and loved to give away to the poor who chanced to meet him whatever he received from kings or wealthy folk. Whether in town or country, he always travelled on foot unless compelled by necessity to ride; and whatever people he met on his walks, whether high or low, he stopped and spoke to them. If they were heathen, he urged them to be baptized; and if they were Christians, he strengthened their faith, and inspired them by word and deed to live a good life and to be generous to others. His life is in marked contrast to the apathy of our own times, for all who walked with him, whether monks or layfolk, were required to meditate, that is, either to read the scriptures or to learn the Psalms. This was their daily occupation wherever they went; and if, on rare occasions, he was invited to dine with the king, he went with one or two clerics, and when he had eaten sparingly, he left as soon as possible to read or pray with them. Many devout men and women of that day were inspired to follow his example, and adopted the practice of fasting until None on Wednesdays and Fridays throughout the year, except during the fifty days after Easter. If wealthy people did wrong, he never kept silent out of respect or fear, but corrected them outspokenly. Nor would he offer money to influential people, although he offered them food whenever he entertained them as host. But, if the wealthy ever gave him gifts of money, he either distributed it for the needs of the poor, as I have mentioned, or else used it to ransom any who had unjustly been sold as slaves. Many of those whom he had ransomed in this way later became his disciples; and when they had been instructed and trained, he ordained them to the priesthood. 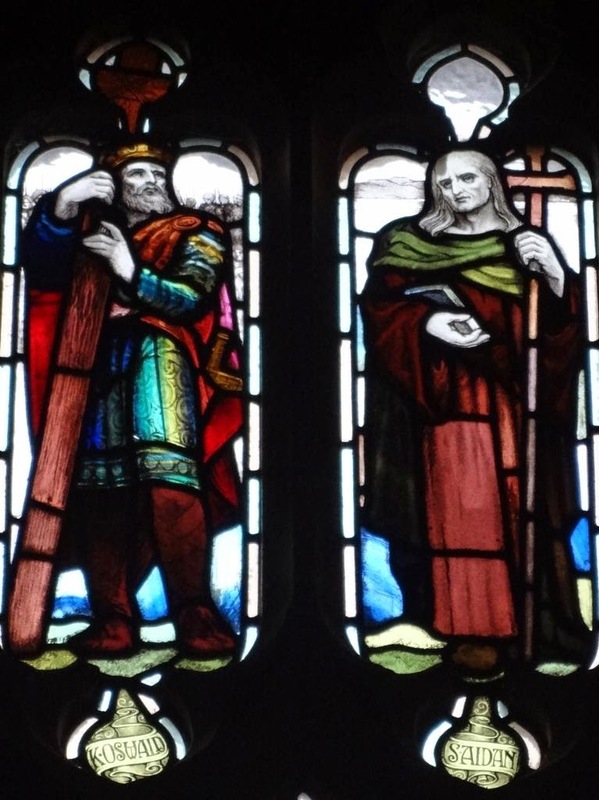 It is said that when King Oswald originally asked the Scots to send a bishop to teach the faith of Christ to himself and his people, they sent him another man of a more austere disposition. After some time, meeting with no success in his preaching to the English, who refused to listen to him, he returned home and reported to his superiors that he had been unable to achieve anything by teaching to the nation to whom they had sent him, because they were a ungovernable people of an obstinate and barbarous temperament. The Scots fathers therefore held a great conference to decide on the wisest course of action; for while they regretted that the preacher whom they had sent had not been acceptable to the English, they still wished to meet their desire for salvation. Then Aidan, who was present at the conference, said to the priest whose efforts had been unsuccessful: "Brother, it seems to me that you were too severe on your ignorant hearers. You should have followed the practice of the Apostles, and begun by giving them the milk of simpler teaching, and gradually nourished them with the word of God until they were capable of greater perfection and able to follow the loftier precepts of Christ." At this the faces and eyes of all who were at the conference were turned towards him; and they paid close attention to all he said, and realized that here was a fit person to be made bishop and sent to instruct the ignorant and unbelieving, since he was particularly endowed with the grace of discretion, the mother of virtues. They therefore consecrated him bishop, and sent him to preach. Time was to show that Aidan was remarkable not only for discretion, but for the other virtues as well. Such then was the bishop who brought knowledge of the faith to King Oswald and the English people under his rule. Thus instructed, Oswald not only learned to hope for the kingdom of heaven, which had been unknown to his ancestors, but was also granted by Almighty God, Creator of heaven and earth, an earthly kingdom greater than they enjoyed. For at length he brought under his sceptre all the peoples and provinces of Britain speaking the four languages, British, Pictish, Scottish and English. 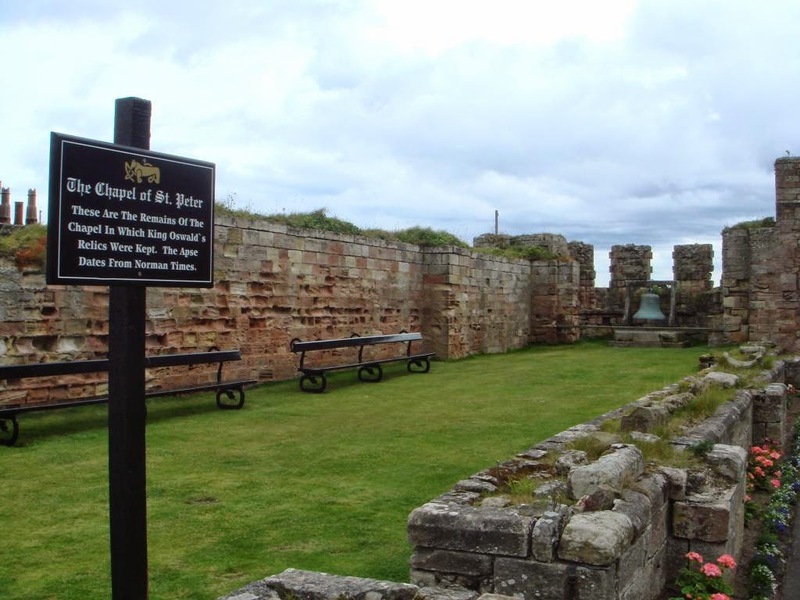 The 'royal city' is Bamburgh, today an imposing fortress, within which stands the chapel mentioned by Bede. Death came to Aidan when he had completed sixteen years of his episcopate, while he was staying at a royal residence near the capital. Having a church and lodging there, Aidan often used to go and stay at the place, travelling about the surrounding countryside to preach. This was his practice at all the king's country-seats, for he had no personal possessions except his church and a few fields around it. When he fell ill, a tent was erected for him on the west side of the church, so that the tent was actually attached to the church wall. And so it happened that, as he drew his last breath, he was leaning against a post that buttressed the wall on the outside. 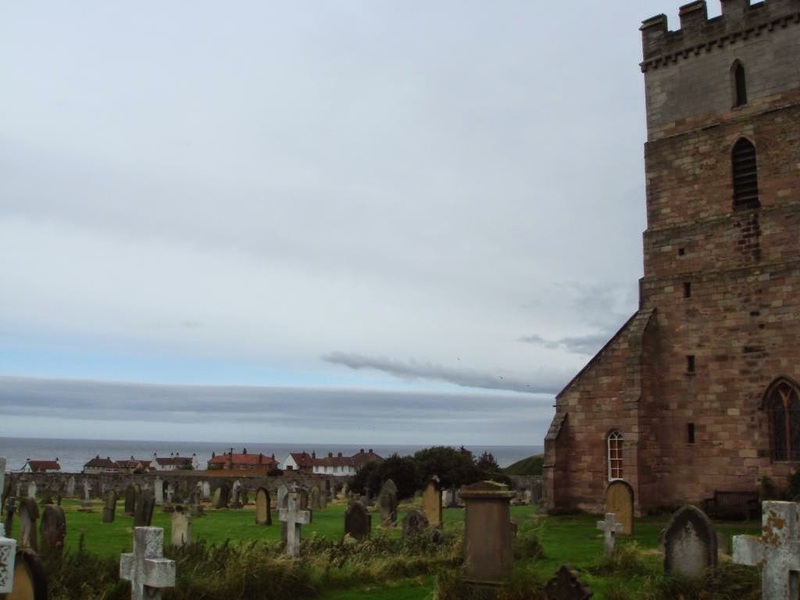 He passed away on the last day of August, in the seventeenth year of his episcopate, and his body was soon taken across to Lindisfarne Island and buried in the monks' cemetery. When a larger church, dedicated to the most blessed Prince of the Apostles, was built there some while later, his bones were transferred to it and buried at the right side of the altar in accordance with the honours due to so great a prelate. Finan, who had also come from the Scottish island and monastery of Iona, succeeded him as bishop and held the office for a considerable time. Some years later, Penda, King of the Mercians, came into these parts with an invading army and destroyed everything that he found with fire and sword; and he burned down the village and the church where Aidan had died. But, in a wonderful manner, the beam against which he was leaning at his death was the only object untouched by the flames which devoured everything around it. This miracle was noticed and a church was soon rebuilt on the same site, with the beam supporting the structure from the outside as before... When the church was rebuilt for a third time, the beam was not employed as an outside support again, but was set up inside the church as a memorial of this miracle, so that those who entered might kneel there and ask God's mercy. Since that day many are known to have obtained the grace of healing at this spot, and many have cut chips of wood from the beam and put them in water, by which means many have been cured of their diseases. I have dealt at length with the character and life of Aidan, although one cannot commend or approve his inadequate knowledge of the proper observance of Easter; indeed, as I have made clear in my book on the seasons, I strongly disapprove of these practices. Nonetheless, as a truthful historian, I have given an accurate account of his life, commending all that was excellent and preserving his memory for the benefit of my readers. He cultivated peace and love, purity and humility; he was above anger and greed, and despised pride and conceit; he set himself to keep as well as to teach the laws of God, and was diligent in study and prayer. He used his priestly authority to check the proud and powerful; he tenderly comforted the sick; he relieved and protected the poor. To sum up in brief what I have learned from those who knew him, he took pains never to neglect anything that he had learned from the writings of the evangelists, apostles and prophets, and he set himself to carry them out with all his powers. I greatly admire and love all these things about Aidan, because I have no doubt that they are pleasing to God; but I cannot approve or commend his failure to observe Easter at the proper time, whether he did it through ignorance of the canonical times or in deference to the custom of his own nation. But this in him I do approve, that in keeping his Easter he believed, worshipped, and taught exactly what we do, namely the redemption of the human race through the Passion, Resurrection and Ascension into heaven of the Man Jesus Christ, the Mediator between God and man. This extract from Ancrene Wisse follows closely (though not directly) on from the one I posted recently. 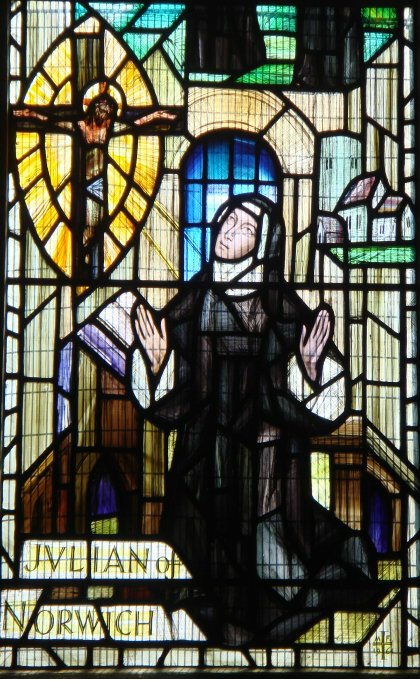 As you can probably tell, the theme of this whole section is 'love' - the intention is to stir up love of God in the hearts of the anchorites, partly by drawing out the meaning of the initial statement that 'God haveth ofgan ure luve on alle cunne wise', 'God has earned our love in every kind of way'. After describing how Christ has wooed the soul like a faithful knight winning a noble lady, the author goes on to discuss the other ways in which Christ is worthy of love. First, this C. S. Lewis of the thirteenth century describes the four loves which exist in the world (his are: between friends, between men and women, between a woman and her child, and between the body and the soul), then goes on to explain how 'the love that Jesus Christ has for his dear beloved surpasses these four, and goes beyond them all'; then, in the following passage, he imagines Christ addressing the anchorite, explaining to her why she ought to give him her love. "Your love," he says, "is either wholly to be given, or to be sold, or to be seized and taken by force. If it is to be given, where could you bestow it better than on me? Am I not the fairest of creatures, am I not the richest of kings, am I not the most highly born, am I not the wisest of wealthy men, am I not the most courteous of men, am I not the most generous of people? For one would say about a liberal man who can withhold nothing, that 'he has his hands pierced' as mine are. Am I not the sweetest and loveliest of all things? Thus all the reasons why love ought to be given one may find in me; above all, if you love chaste purity; for no one may love me unless she guards herself. This chastity is threefold: widowhood, marriage and maidenhood, the highest. If your love is not to be given, but you want me to buy it – to buy it? How? Either with love or with something else. Love is sold for love – and so love ought to be sold, and for nothing else. If your love is to be sold in this way, I have bought it with love above all others; because of the four greatest loves I have shown the greatest of them all towards you. If you say you do not want to sell it at so cheap a price, but want still more, name what it shall be, set the price of your love. You cannot say so much that I will not pay more. Do you want castles, kingdoms? Do you want to rule the whole world? I will give you better – make you queen of the kingdom of heaven with all this. You shall be seven times brighter than the sun, no evil shall come near you, and joy will never be lacking for you; everything you want shall be done in heaven and on earth too, yes, even in hell; no heart ever imagined what happiness I would give you for your love, immeasurably, incomparably, infinitely more: all the wealth of Croesus, who was the richest of kings; the radiant beauty of Absalom, who as often as his hair was trimmed sold the cuttings – the hair that he cut off – for two hundred shekels weighed in silver; the speed of Asahel, who competed with deer in running; the strength of Samson, who killed a thousand of his enemies at once alone, without companions; the generosity of Caesar; the renown of Alexander; the vigour of Moses. Would not a man give all that he owned for one of these? And all these together are not worth a needle compared to my body. If you are so very obstinate and so out of your mind that, although you have nothing to lose, you forsake such advantages and happiness of every sort, look, I hold here a cruel sword over your head with which to separate life and soul and plunge them both into the fire of hell to be the devil’s whore, shamefully and miserably for ever. Now answer and defend yourself if you can against me, or grant me your love which I long for so much, not for my sake, but for your own great advantage." Thus our Lord woos us. Is she not very hard-hearted who after such a wooing will not turn to his love, if she thinks well about these three things, what he is, what she is, and how great is the love of one as high as he is towards one as low as she is? And so, the psalmist says 'there is nothing hidden from the heat of the sun'. There is no one who may hide away so that she may not love him. The true sun climbed up high in the third hour of the day for your sake on the high cross, in order to spread love’s hot rays; thus he was eager, and is until this day, to kindle his love in the heart of his beloved, and he says in the Gospel, 'I am come to send fire on the earth, and what will I, if it be already kindled?' I am come, he says, to bring fire to the earth, that is, burning love to earthly hearts, and what do I long for except for it to burst into flame? "Thi luve," he seith, " - other hit is for-te yeoven allunge, other hit is to sullen, other hit is to reavin ant to neomen with strengthe. Yef hit is for-te yeoven, hwer maht tu biteon hit betere then up-o me? Nam ich thinge feherest? Nam ich kinge richest? Nam ich hest i-cunnet? Nam ich weolie wisest? Nam ich monne hendest? Nam ich thinge freoest? For swa me seith bi large mon the ne con nawt edhalden, thet he haveth the honden, as mine beoth, i-thurlet. Nam ich alre thinge swotest ant swetest? Thus alle the reisuns hwi me ah to yeove luve thu maht i-finden in me; nomeliche yef thu luvest chaste cleannesse. For nan ne mei luvie me bute ha hire halde. Ah ha is threo-vald: i widewehad, i spushad, i meidenhad, the heste. Yef thi luve nis nawt to yeovene, ah wult thet me bugge hire - buggen hire? Hu? Other with other luve other with sum-hweat elles. Me suleth wel luve for luve ant swa me ah to sulle luve, ant for na thing elles. Yef thin is swa to sullen ich habbe i-boht hire with luve over alle othre. For of the fowr measte luven, ich habbe i-cud toward te the measte of ham alle. Yef thu seist thu nult nawt leote th'ron se liht chap, ah wult yette mare, nempne hweat hit schule beon. Sete feor o thi luve. Thu ne schalt seggen se muchel thet ich nule yeove mare. Wult tu castles, kinedomes? Wult tu wealden al the world? Ich chulle do the betere, makie the, with al this, cwen of heove-riche. Thu schalt te-seolf beo seove-vald brihtre then the sunne. Nan uvel ne schal nahhi the. Na wunne ne schal wonti the. Al thi wil schal beon i-wraht in heovene ant ec in eorthe - ye, ant yet in helle. Ne schal neaver heorte thenchen hwuch selhthe thet ich nule yeoven for thi luve unmeteliche, unevenliche, unendeliche mare. Al Creasuse weole, the wes kinge richest. Absalones schene wlite, the as ofte as me evesede him, salde his evesunge, the her thet he kearf of for twa hundret sicles of seolver i-weiet. Asaeles swiftschipe, the straf with heortes of urn. Samsones strengthe, the sloh a thusent of his fan al ed a time, ant ane, bute fere. Cesares freolec. Alixandres here-word. Moysese heale. Nalde a mon for an of theos yeoven al thet he ahte? Ant alle somet, ayein mi bodi, ne beoth nawt wurth a nelde. Yef thu art se swithe ane-wil ant swa ut of thi wit thet tu, thurh nawt to leosen, forsakest swuch biyete, with alles cunnes selhthe, lo, ich halde her heatel sweord up-o thin heaved to dealen lif ant sawle, ant bisenchen ham ba into the fur of helle, to beon deofles hore schentfulliche ant sorhfulliche world abuten ende. Ondswere nu ant were the, yef thu const, ayein me, other yette me thi luve the ich yirne se swithe - nawt for min ah for thin ahne muchele biheve." Lo, thus ure Laverd woheth. Nis ha to heard i-heortet thet a thulli wohere ne mei to his luve turnen, yef ha wel thencheth theose threo thinges: hwet he is ant hwet heo is, ant hu muchel is the luve of se heh as he is toward se lah as heo is? For-thi seith the Salm-wruhte: Non est qui se abscondat a calore ejus. Nis nan thet mahe edlutien thet ha ne mot him luvien. The sothe sunne i the under-tid wes for-thi i-stihen on heh, o the hehe rode, for-te spreaden over-al hate luve-gleames; [thus neodful he wes ant is athet tes dei to ontenden his luue i his leoues heort, & seith i the godspel, Ignem ueni mittere in terram, & quid uolo nisi ut ardeat.] "Ich com to bringen," he seith, "fur into eorthe" - thet is, bearninde luve into eorthlich heorte - "ant hwet yirne ich elles bute thet hit bleasie?" "...I should be sorry, you know, to think ill of a young man who has lived so long in Derbyshire." No scheme could have been more agreeable to Elizabeth, and her acceptance of the invitation was most ready and grateful. 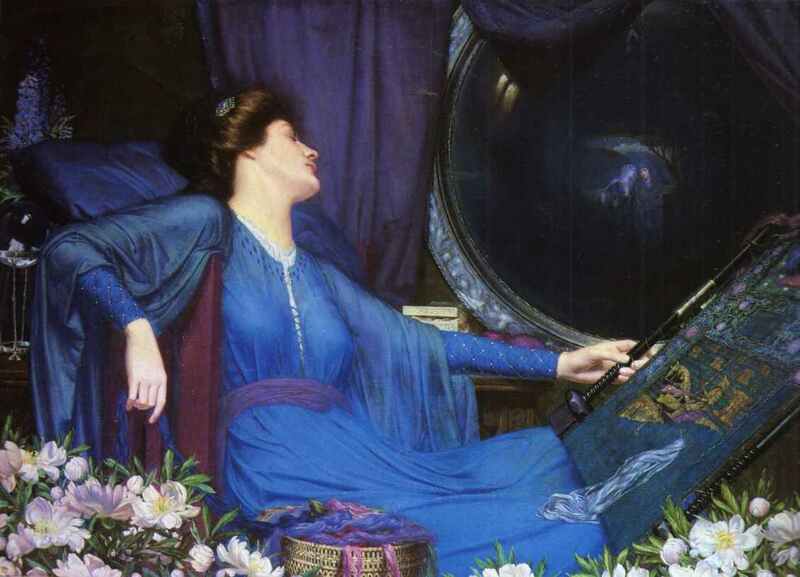 "My dear, dear aunt," she rapturously cried, "what delight! what felicity! You give me fresh life and vigour. Adieu to disappointment and spleen. What are men to rocks and mountains? Oh! what hours of transport we shall spend! And when we do return, it shall not be like other travellers, without being able to give one accurate idea of anything. We will know where we have gone—we will recollect what we have seen. Lakes, mountains, and rivers shall not be jumbled together in our imaginations; nor when we attempt to describe any particular scene, will we begin quarreling about its relative situation. Let our first effusions be less insupportable than those of the generality of travellers." The Gardiners stayed only one night at Longbourn, and set off the next morning with Elizabeth in pursuit of novelty and amusement. One enjoyment was certain—that of suitableness of companions; a suitableness which comprehended health and temper to bear inconvenience— cheerfulness to enhance every pleasure— and affection and intelligence, which might supply it among themselves if there were disappointments abroad. It is not the object of this work to give a description of Derbyshire, nor of any of the remarkable places through which their route thither lay; Oxford, Blenheim, Warwick, Kenilworth, Birmingham, &, are sufficiently known. A small part of Derbyshire is all the present concern. 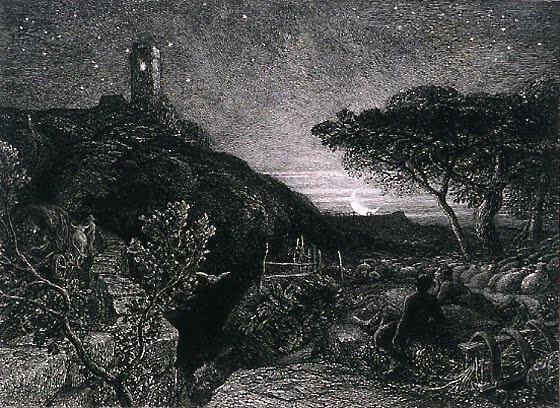 To the little town of Lambton, the scene of Mrs. Gardiner's former residence, and where she had lately learned some acquaintance still remained, they bent their steps, after having seen all the principal wonders of the country; and within five miles of Lambton, Elizabeth found from her aunt that Pemberley was situated. It was not in their direct road, nor more than a mile or two out of it. In talking over their route the evening before, Mrs. Gardiner expressed an inclination to see the place again. Mr. Gardiner declared his willingness, and Elizabeth was applied to for her approbation. 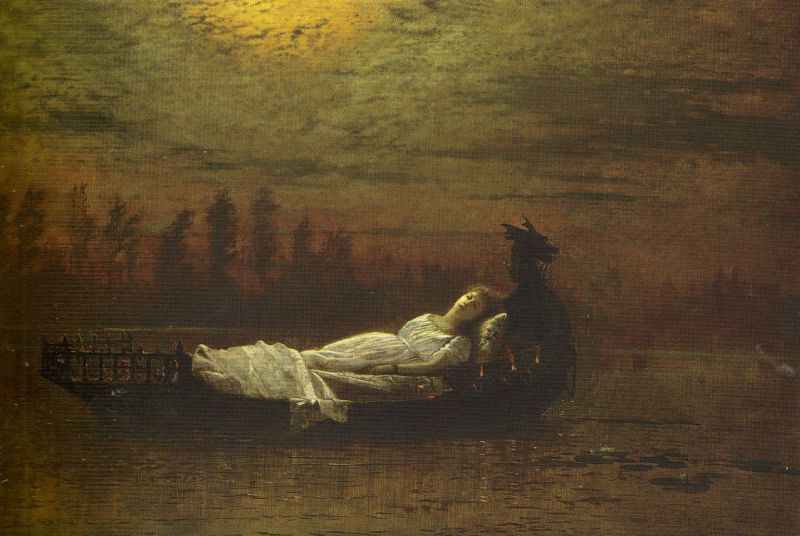 Elizabeth said no more—but her mind could not acquiesce. The possibility of meeting Mr. Darcy, while viewing the place, instantly occurred. It would be dreadful! She blushed at the very idea, and thought it would be better to speak openly to her aunt than to run such a risk. But against this there were objections; and she finally resolved that it could be the last resource, if her private inquiries to the absence of the family were unfavourably answered. Accordingly, when she retired at night, she asked the chambermaid whether Pemberley were not a very fine place? what was the name of its proprietor? and, with no little alarm, whether the family were down for the summer? A most welcome negative followed the last question—and her alarms now being removed, she was at leisure to feel a great deal of curiosity to see the house herself; and when the subject was revived the next morning, and she was again applied to, could readily answer, and with a proper air of indifference, that she had not really any dislike to the scheme. To Pemberley, therefore, they were to go. "And of this place," thought she, "I might have been mistress! With these rooms I might now have been familiarly acquainted! Instead of viewing them as a stranger, I might have rejoiced in them as my own, and welcomed to them as visitors my uncle and aunt. But no," recollecting herself—"that could never be; my uncle and aunt would have been lost to me; I should not have been allowed to invite them." In the gallery there were many family portraits, but they could have little to fix the attention of a stranger. Elizabeth walked in quest of the only face whose features would be known to her. At last it arrested her—and she beheld a striking resemblance to Mr. Darcy, with such a smile over the face as she remembered to have sometimes seen when he looked at her. She stood several minutes before the picture, in earnest contemplation, and returned to it again before they quitted the gallery. Mrs. Reynolds informed them that it had been taken in his father's lifetime. There was certainly at this moment, in Elizabeth's mind, a more gentle sensation towards the original than she had ever felt at the height of their acquaintance. The commendation bestowed on him by Mrs. Reynolds was of no trifling nature. What praise is more valuable than the praise of an intelligent servant? As a brother, a landlord, a master, she considered how many people's happiness were in his guardianship!—how much of pleasure or pain was it in his power to bestow!—how much of good or evil must be done by him! Every idea that had been brought forward by the housekeeper was favourable to his character, and as she stood before the canvas on which he was represented, and fixed his eyes upon herself, she thought of his regard with a deeper sentiment of gratitude than it had ever raised before; she remembered its warmth, and softened its impropriety of expression. The others then joined her, and expressed admiration of his figure; but Elizabeth heard not a word, and wholly engrossed by her own feelings, followed them in silence. She was overpowered by shame and vexation. Her coming there was the most unfortunate, the most ill-judged thing in the world! How strange it must appear to him! In what a disgraceful light might it not strike so vain a man! It might seem as if she had purposely thrown herself in his way again! Oh! why did she come? Or, why did he thus come a day before he was expected? Had they been only ten minutes sooner, they should have been beyond the reach of his discrimination; for it was plain that he was that moment arrived—that moment alighted from his horse or his carriage. She blushed again and again over the perverseness of the meeting. And his behaviour, so strikingly altered—what could it mean? That he should even speak to her was amazing!—but to speak with such civility, to inquire after her family! Never in her life had she seen his manners so little dignified, never had he spoken with such gentleness as on this unexpected meeting. What a contrast did it offer to his last address in Rosings Park, when he put his letter into her hand! She knew not what to think, or how to account for it. They had now entered a beautiful walk by the side of the water, and every step was bringing forward a nobler fall of ground, or a finer reach of the woods to which they were approaching; but it was some time before Elizabeth was sensible of any of it; and, though she answered mechanically to the repeated appeals of her uncle and aunt, and seemed to direct her eyes to such objects as they pointed out, she distinguished no part of the scene. Her thoughts were all fixed on that one spot of Pemberley House, whichever it might be, where Mr. Darcy then was. She longed to know what at the moment was passing in his mind—in what manner he thought of her, and whether, in defiance of everything, she was still dear to him. Perhaps he had been civil only because he felt himself at ease; yet there had been that in his voice which was not like ease. Whether he had felt more of pain or of pleasure in seeing her she could not tell, but he certainly had not seen her with composure. The conversation soon turned upon fishing; and she heard Mr. Darcy invite him, with the greatest civility, to fish there as often as he chose while he continued in the neighbourhood, offering at the same time to supply him with fishing tackle, and pointing out those parts of the stream where there was usually most sport. Mrs. Gardiner, who was walking arm-in-arm with Elizabeth, gave her a look expressive of wonder. Elizabeth said nothing, but it gratified her exceedingly; the compliment must be all for herself. Her astonishment, however, was extreme, and continually was she repeating, "Why is he so altered? From what can it proceed? It cannot be for me—it cannot be for my sake that his manners are thus softened. My reproofs at Hunsford could not work such a change as this. It is impossible that he should still love me." After walking some time in this way, the two ladies in front, the two gentlemen behind, on resuming their places, after descending to the brink of the river for the better inspection of some curious water-plant, there chanced to be a little alteration. It originated in Mrs. Gardiner, who, fatigued by the exercise of the morning, found Elizabeth's arm inadequate to her support, and consequently preferred her husband's. Mr. Darcy took her place by her niece, and they walked on together. After a short silence, the lady first spoke. She wished him to know that she had been assured of his absence before she came to the place, and accordingly began by observing, that his arrival had been very unexpected—"for your housekeeper," she added, "informed us that you would certainly not be here till to-morrow; and indeed, before we left Bakewell, we understood that you were not immediately expected in the country." He acknowledged the truth of it all, and said that business with his steward had occasioned his coming forward a few hours before the rest of the party with whom he had been travelling. "They will join me early to-morrow ," he continued, "and among them are some who will claim an acquaintance with you—Mr. Bingley and his sisters." He then asked her to walk into the house—but she declared herself not tired, and they stood together on the lawn. At such a time much might have been said, and silence was very awkward. She wanted to talk, but there seemed to be an embargo on every subject. At last she recollected that she had been travelling, and they talked of Matlock and Dovedale with great perseverance. Yet time and her aunt moved slowly—and her patience and her ideas were nearly worn our before the tete-a-tete was over. On Mr. and Mrs. Gardiner's coming up they were all pressed to go into the house and take some refreshment; but this was declined, and they parted on each side with utmost politeness. Mr. Darcy handed the ladies into the carriage; and when it drove off, Elizabeth saw him walking slowly towards the house. I'm sure there was a time when I used to post something on this blog other than pictures of churches and early-twentieth-century poetry, but I can't for the life of me remember what that something was. And so: Rupert Brooke. Yesterday I took a walk to Headington Quarry, an area on the outskirts of Oxford where C. S. Lewis lived for the last thirty years of his life, and where he is buried. I've visited his grave in the churchyard before, but have never managed to see the church, which is usually closed. Yesterday I googled it and saw from the church website that it would be open for a few hours in the afternoon, for the last time this year. So I decided to go and explore, and here are the photographic fruits of my expedition. 'Church open' is one of those signs which delights the visitor's heart; sadly, in this case it proved to be a false hope, a snare and a delusion, if you will. For alas, the church was not open. At least, there was a wedding going on, and from the lusty singing of 'Lord of the Dance' which greeted me when I arrived at half past two, it seemed likely to continue for some time. Although it has a medieval look to it, the church was actually built in 1848-9, since Headington Quarry (a settlement which had grown up around the stone quarry, as you probably could have guessed!) then had no church of its own. It was designed by George Gilbert Scott, and fits quietly and unobtrusively in its surroundings; you might easily believe it had been here for a thousand years. Random chickens and horses - why not? This is not actually rolling countryside at all (the Oxford bypass is just the other side of the hill) but it feels a lot like it. The east window is by Ninian Comper. It was installed in 1991, and the engraved glass depicts various elements from the world of Narnia. "And we were glad at heart"